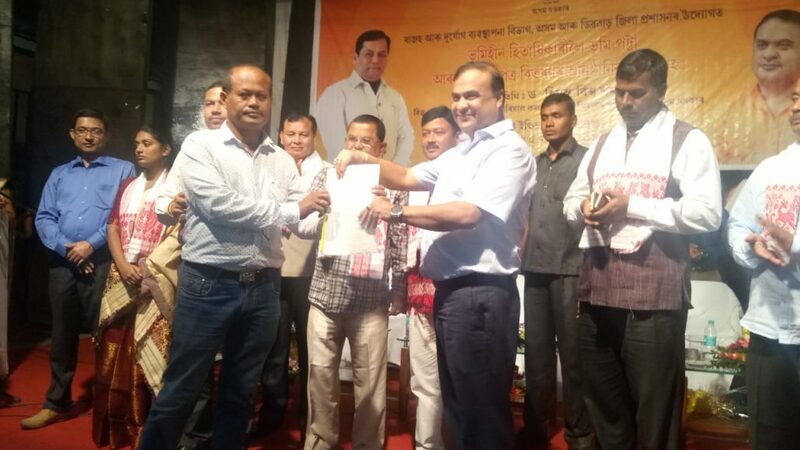 Health and family welfare minister Himanta Biswa Sarma on Monday distributed 1526 land pattas to the indigenous landless people of upper Assam Dibrugarh district. The people from seven revenue circle in Dibrugarh district get benefitted through the land pattas provided to them. The gesture of distributing land pattas to the landless people is an extension of the state government’s commitment to ensure land rights to the indigenous people of the state. Speaking on the occasion, Himanta Biswa Sarma said the step taken by the government is commendable and 12000 landless people of Assam will be benefitted. “Our government is very much dedicated and committed to provide land pattas to the landless people of Assam. Large number of indigenous people living in Assam for many years without land pattas, so our government has decided to provide land pattas to the people in phased manner,”. Sarma said, “For the higher education of the poor students government will provide free education. Assam is the first state to provide free education to the poor people to pursue higher education,”. Deputy Comissioner Laya Madduri, Dibrugarh MLA Prasanta Phukan, Lahowal MLA Rituparna Barua, Moran MLA Chakradhar Gogoi, Dulijan MLA Teros Gowala, Naharakatia MLA Naresh Sonowal were present during the programme.